in developing, educating and caring for pre-school children. for young children as they begin their adventure into socialising and learning. Why Little Acorns Day Nursery ? Little Acorns Day Nursery is a family run, progressive, independent day nursery group, founded on the pioneering work of our owner and principal Teresa Stear. Teresa qualified in 1981 and her professional experience and leadership underpins our commitment to innovation and quality that goes above and beyond the normal standards of pre-school child care and development. With over 30 years of Childcare experience, 25 of which at management level, Teresa is well versed with the responsibilities of the daily administration whilst adhering to the Policies & Procedures of Little Acorns ensuring compliance with the Children Act and Health and Safety legislation, all within the requirements and guidelines laid down by Ofsted. 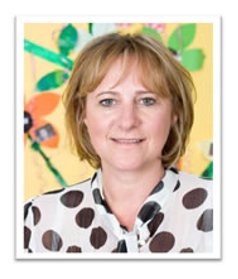 Teresa is responsible for ensuring effective staff recruitment and supervision across the nursery group. We provide a safe, nurturing atmosphere, and strongly believe children thrive independently whilst learning and developing through play and exploration. Our highly qualified and experienced team deploy a wide variety of activities around the Early Years Foundation Stage. We are within easy access of public transport services, including bus routes, mainline and underground stations, which offer excellent connections for business commuters and busy parents. Large shopping centres are also conveniently located nearby. “Babies are engaged in a range of experiences to support learning and development. Practitioners understand how to support this stage of development, modelling accessible language, using song and rhyme, and planning for activities which involve all the senses”. “Practitioners provide a good model for more complex language and concepts, and differentiate this well according to children’s stage of development”. “Children’s independence and self-care skills are well encouraged”. “Displays around the room evidence the range of rich learning experiences the children are involved in”. “The environment is organised to promote learning across all areas with a range of interesting resources”. All rooms and gardens are arranged to develop the seven areas of learning as set out in the EYFS guidelines. There is a separate covered area in the outside play area for the non-crawlers and more hesitant players with built in sand and water trays, a planting area and many stage appropriate toys. Walls are decorated with colourful displays, including examples of the children’s work connected with the current child lead planning. Interest tables, or nature tables, are available at child height, with properly labelled objects for children to handle and explore. The children have access to child height toilets and wash basins with sensor taps, and also in these toilet rooms are electric hand driers to supported independence.